This spacious van has taken the car rental industry by storm and is quickly becoming one of the most requested vans. 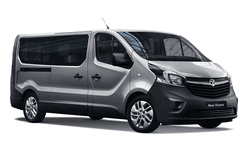 Opel Vivaro is turning heads and is rising in the ranks as one of the most popular vans in its class. It comes with automatic drive, airbags, anti-lock brake system, gets great mileage, and has several colours that you can choose from. It seats 5 comfortably and has space for everything you need to take with you wherever the road is leading you. If you need space as well as power then you need the Opel Vivaro. But be sure to act fast because this popular model will not last long and the demand is high, so make a reservation today and see the difference for yourself!